Crash Forensics performs complete analysis of compliance with regulatory and industry truck safety standards including; driving of commercial motor vehicles, qualifications of truck drivers, truck equipment requirements, truck drivers' hours of service and log books, and the inspection, repair, and maintenance of trucks. Link to our truck safety expert. The minimum standard of care for the safe operation of trucks is established by sections of the Code of Federal Regulations (CFR49) commonly known as the Federal Motor Carrier Regulations or FMCSR. The FMCSR is made up of many sections covering topics such as Licensing and Knowledge Requirements of Truck Drivers, Qualifications of Drivers, Safe Driving Requirements for Commercial Motor Vehicles, Equipment Requirements, Hours of Service Requirements, Equipment Inspection and Maintenance, etc. Another important document that speaks to the minimum standard of care for the safe operation of trucks is the Commercial Drivers License (CDL) Manual. 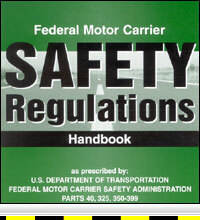 The CDL Manual was created in order to teach the knowledge required by the FMCSR to truck drivers. Therefore, the information in the CDL Manual is required knowledge for any person driving a truck with a commercial drivers license. The model CDL Manual is produced by the American Association of Motor Vehicle Administrators (AAMVA). According to the AAMVA, every state has adopted their CDL Manual. From state to state, the only variation in the CDL Manual is the artwork on the cover and an Introduction section where the states provide information specific to their state. Many states simply use the CDL Manual with the AAMVA model cover and make no additions to the Introduction section. Other states, such as California, have added as much as 18 pages of state-related information. In addition to the FMCSR and CDL, many industry groups establish standards for the safe operation of trucks through various publications and training materials. Some examples of these groups would be the American Trucking Association, J.J. Keller and Associates, the National Safety Council, etc. A common misunderstanding worth noting involves the previously discussed FMCSR. This misunderstanding is that these FMCSR standards only apply to trucks that require a CDL to drive ("Heavy Duty" Class 7 and Class 8 trucks). However, this is not true. Aside from the CDL requirements and the drug test requirement, the FMCSR applies both to all vehicles with a Gross Vehicle Weight Rating (GVWR) in excess of 10,000 pounds and to vehicles pulling trailers with a combined GVWR in excess of 10,000 pounds. These include all "Medium Duty" trucks and some "Light Duty" trucks or, stated differently, all Class 3 to Class 6 trucks. Examples of Class 3 trucks are a Ford F-350 or a GM 3500. These Class 3 trucks are commonly referred to as one-ton trucks. Class 3 to Class 6 trucks are frequently used in construction, landscaping, lawn care, etc, but very seldom do drivers operate them in compliance with the FMCSR. Additionally, Class 1 and Class 2 (e.g., Ford F-150 or F-250) trucks are also governed by the FMCSR when combined with certain trailers.